El Salvador is well known for being one of the most violent countries in the world. And yet it is also a society that is doing its best to overcome years of political repression and social and economic injustice. There are many dedicated, courageous Salvadorans who are working every day to provide opportunities for young people, to address the causes of violence and to stem the effects of intergenerational trauma. 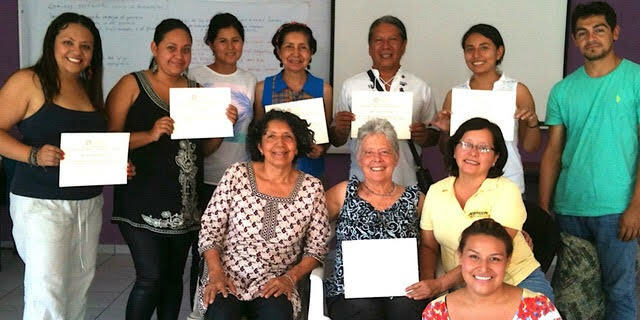 Focusing El Salvador supports these people by teaching the transformative practices of Focusing and Compassionate Communication. Need: a physiological or psychological requirement for the well-being of an organism. Many of us were not raised to pay attention to our needs. When our needs are not met, we feel angry, upset and many other emotions. The societal tendency is to blame others for how we feel, rather than defining our needs and expressing them so that we can take action toward meeting them. Nonviolent Communication, developed by Marshall Rosenberg, PhD, teaches us how to do this. Find out more at cnvc.org. Focusing, developed by Eugene Gendlin, PhD, teaches us how to listen to the wisdom of our bodily felt sense of situations. The body’s “take” on a situation can give us multiple levels of insight that are not accessible to our regular mental patterns. When attempting to address conflict or confusion, the bodily felt sense can tell us what is needed more clearly than our thoughts. Using these practices in our lives helps us listen for what is needed, rather than reacting in patterned ways. In El Salvador, we have several projects that are supported by donations from people around the world. We also teach classes in Focusing and Compassionate Communication, online and in person. 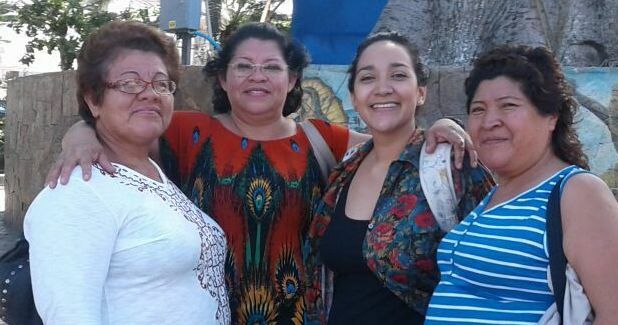 Focusing El Salvador’s Heazel Martinez (third from left) with workers from the women’s prison. We pay Heazel $500 per month to organize Focusing activities in El Salvador. Her free workshops to prison employees help them understand the benefits of what we do, and hopefully will lead to paid trainings in the future. We need to raise $3,000 towards Heazel’s salary for 2018. 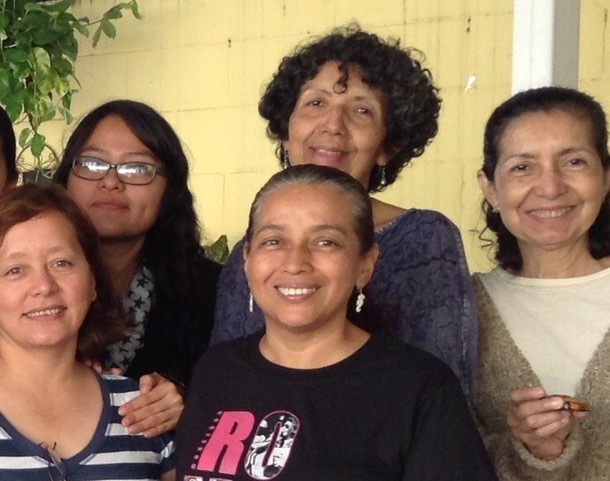 There are 10 Salvadoran community workers who have incorporated Focusing into their lives and want to become Focusing trainers. They work for non-profits and can’t afford to pay for the training. Your donation will help them achieve certification. Focusing El Salvador is based on Gene and Mary Gendlin’s desire for humanity to claim Focusing as its birthright. That’s why every one of our trainees pictured above works for a well-established community organization. All these people have incorporated Focusing into their lives and want to become certified Focusing trainers. So by supporting us, you are supporting all of them and all the people they serve. You also provide a small salary for our Communications Manager, Heazel Martínez. She not only organizes our trainings and classes, but is available to respond to people who want to experience what Focusing is all about. Whether it is a youth group or the staff of a women’s prison, Heazel is there to listen and to help people listen to themselves. Your donation makes you part of our movement. You know the importance of listening and to helping people listen to themselves. Traditional funding sources are not yet aware of how important that is. That’s why we need your help! Please consider a gift in the amount of : $1000; $500; $250; $100; $50 (or whatever amount is right for you). MUCHISSIMAS GRACIAS! Or you can send a donation through PayPal. This won’t be tax deductible. We are people who have experienced the benefits of Focusing, Listening and Compassionate Communication in our lives and relationships and want to share these benefits with the world. Every time we pause and sense how we are feeling inside, every time we pay attention to what we need, our lives get a little bit better. Every time we remember to really listen to someone else, or to express what we need, our relationships open up to love and sharing. A lot of people have never experienced this, so they live in fear of what is inside themselves and outside themselves. The world is on the brink of change, and we feel that what we have experienced will help us move into the future without destroying our beautiful planet. That’s why it’s so important to us to share it. Beatrice volunteered at a clinic for Salvadoran refugees in the 1980s, during the Salvadoran Civil War. 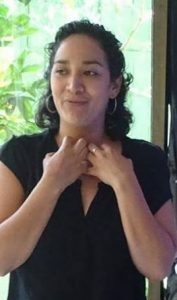 Since then, she has wanted to do everything in her power to help her Salvadoran friends change Salvadoran society from repression to social justice. In 2006 she met former guerrilla Melba Jiménez, who was interested in overcoming the mental health effects of the war. They became friends and Melba arranged for Beatrice to give workshops in Focusing and Compassionate Communication to a number of community organizations. As Melba and Beatrice applied these practices in their own lives, they became convinced that these skills could help people overcome political and societal divisions as well. Heazel has a special gift for listening and for helping people listen to themselves so that they can “accompany” what they are feeling. This simple act of listening and accompanying is the essence of Focusing. Once you are in touch with how you feel, you can sense what you need and express that to others if necessary. 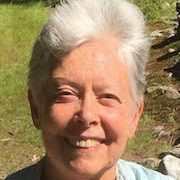 Focusing and Compassionate Communication have put Heazel “in the driver’s seat” of her own life. She is a wife, a mother, a student of social work and is on her way to becoming a Certified Focusing Trainer. 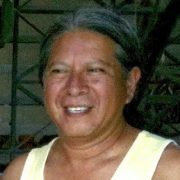 Juan Carlos is a consultant and group facilitator specializing in Conflict Transformation, Psychosocial Self Care, Leadership, and Organizational Development for many groups in El Salvador, Nicaragua and Colombia. In addition to Focusing, he has studied Somatic Experiencing, Bioenergetics and Family Constellations. Juan Carlos sees conflict as an opportunity for transformation. To be determined by participants. The combination of these two practices has given me confidence in dealing with conflict in my personal life. I love hearing examples of how it the class heals and smooths the lives of my students. Empathic Communication is based on Nonviolent Communication, a theory developed by Marshall Rosenberg, PhD. NVC teaches that all human beings have needs, and that our needs are beautiful because they motivate us to live fully. Anger, sadness and distress arise when our needs are unmet. NVC teaches us to identify our needs and to express them clearly to others. NVC can be deepened and enhanced by getting the felt sense of situations, as we do in Focusing. Cost: US$175 for seven 2-hour sessions, payable by PayPal. If you’d prefer to pay by check, or if you have any questions, please fill out the contact form below and I’ll get back to you. Don’t forget to scroll down and click on “Submit”. Please let us know if we can provide you with more information about who we are, our projects, how you can help and our classes. Thanks for your interest!